"Chronicle of the Battle of Ichinotani is a five-act history play written for the Toyotake puppet theater in Osaka. The first performance was in 1751 and was followed the next year by a kabuki version in both Osaka and Edo. The story concerns the twelfth-century struggle between the Genji (Minamoto) clan, which was led by Yoshitsune and Yoritomo, and the Heike (Taira) clan, which had close ties to the emperor. In the thirteenth-century military epic The Tale of the Heike, which is the original source of this story, Atsumori, a young Heike warrior, is slain by Kumagai, an older Genji warrior who wants to spare the young man's life because Atsumori reminds him of his own son but is forced to slay him because his own troops are approaching. In the story's reincarnation in the late medieval nō play Atsumori, the ghost of the slain Atsumori, who is the protagonist (shite), recalls and relives his struggle with Kumagai, who has become a priest, taking the Buddhist name Renshō. In the end, Kumagai, once Atsumori's foe, becomes his spiritual ally and prays for his salvation. In Chronicle of the Battle of Ichinotani the story has been completely recast, adding, in the manner of Edo drama, love relationships with women and a complex web of hidden obligations and ties. 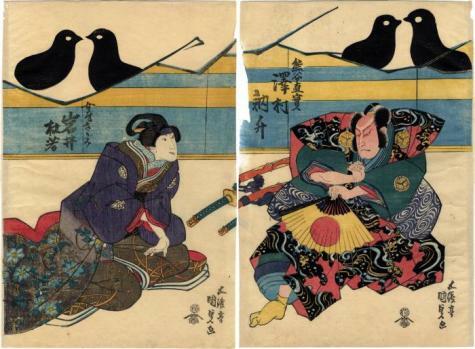 Kumagai, the Genji warrior, has been ordered by his superior, the Genji general Yoshitsune, to kill Atsumori, a young Heike warrior and the son of the emperor by Lady Fuji. Kumagai is in a deep dilemma, for earlier both his life and that of his wife Sagami were saved by Atsumori's mother, Lady Fuji, who pardoned them for a serious transgression, but he must do his duty to his lord and the cause for which he is fighting. To satisfy both his commander Yoshitsune and his conscience, he substitutes the head of his own son Kojirō for that of Atsumori, whom he has taken prisoner. As it turns out, Yoshitsune also has hidden obligations to the Heike, specifically to Yaheibyoe Munekiyo, who saved him and his brother Yoritomo as children and who appears in disguise here as Midaroku, an old woodcutter. In the end Yoshitsune pays back Munekiyo by returning Atsumori to the Heike." Quoted from: Early Modern Japanese Literature: An Anthology, 1600-1900 by Haruo Shirane. Another thing to note is the iconography of this scene. The two facing birds are the personal crest of Kumagai.